He was born in Palermo, Sicily. His father, a landed gentleman, delayed venturing out to register his son's birth for fear of Giuseppe Garibaldi's 1,000 patriots who had just stormed into Sicily on the first leg of their march to build an Italian nation. He taught law at the University of Palermo and was recognized as an eminent jurist. After the Italian military disaster in World War I at Caporetto on 25 October 1917, which led to the fall of the Boselli government, Orlando became Prime Minister, and he continued in that role through the rest of the war. He had been a strong supporter of Italy's entry in the war. He successfully led a patriotic national front government, the Unione Sacra, and reorganized the army. Orlando was encouraged in his support of the Allies because of secret incentives offered to Italy in the London Pact of 1915. Italy was promised significant territorial gains in Dalmatia. Orlando's first act as head of the government was to fire General Luigi Cadorna and appoint the well-respected General Armando Diaz in his place. He then reasserted civilian control over military affairs, which Cadorna had always resisted). His government instituted new policies that treated Italian troops less harshly and instilled a more efficient military system, which were enforced by Diaz. The Ministry for Military Assistance and War Pensions was established, soldiers received new life insurance policies to help their families in the case of their deaths, more funding was put into propaganda efforts aimed at glorifying the common soldier, and annual paid leave was increased from 15 to 25 days. On his own initiative Diaz also softened the harsh discipline practiced by Cadorna, increased rations, and adopted more modern military tactics which had been observed on the Western Front. All of these had the net effect of greatly increasing the formerly-crumbling army's morale. Orlando's government quickly proved popular among the general population and successfully reconstituted national morale after the disaster of Caporetto, with Orlando even publicly pledging to retreat to "my Sicily" if necessary and resist the Austrian invaders from there, though he was also assured that there would be no military collapse. With the Austro-Hungarian offensive stopped by Diaz at the Second Battle of the Piave River, a lull in fighting ensued on the Italian front as both sides brought up their logistical elements. Orlando ordered an investigation into the causes of the defeat at Caporetto, which confirmed that it was the fault of the military leadership. While he continued to reform the military, he refused demands from both sides of the political aisle calling for mass trials of generals and ministers. The Italian front stabilized enough under his leadership that Italy was able to send hundreds of thousands of troops to the Western Front to buttress their allies while themselves preparing for a major offensive to knock Austria-Hungary out of the war. This offensive materialized in November 1918, the Italians launched the Battle of Vittorio Veneto and routed the Austro-Hungarians, a feat that coincided with the collapse of Austro-Hungarian Army and the end of the First World War on the Italian Front, as well as the end of the Austro-Hungarian Empire. The fact that Italy recovered and ended up on the winning side in 1918 earned for Orlando the title "Premier of Victory." He was one of the Big Four, the main Allied leaders and participants at the Paris Peace Conference in 1919, along with U.S. President Woodrow Wilson, French Prime Minister Georges Clemenceau and Britain's Prime Minister David Lloyd George. Although, as prime minister, he was the head of the Italian delegation, Orlando's inability to speak English and his weak political position at home allowed the conservative foreign minister, the half-Welsh Sidney Sonnino, to play a dominant role. Their differences proved to be disastrous during the negotiations. Orlando was prepared to renounce territorial claims for Dalmatia to annex Rijeka (or Fiume as the Italians called the town) - the principal seaport on the Adriatic Sea - while Sonnino was not prepared to give up Dalmatia. Italy ended up claiming both and received neither, running up against Wilson's policy of national self-determination. Orlando supported the Racial Equality Proposal introduced by Japan at the conference. His political position was seriously undermined by his failure to secure Italian interests at the Paris Peace Conference. Orlando resigned on 23 June 1919, following his inability to acquire Fiume for Italy in the peace settlement. The so-called "Mutilated victory" was one of the causes of the rising of Benito Mussolini. 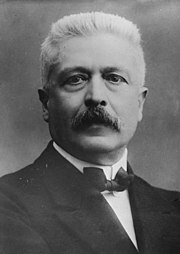 In December 1919 he was elected president of the Italian Chamber of Deputies, but never again served as prime minister. When Benito Mussolini seized power in 1922, Orlando initially tactically supported him, but broke with Il Duce over the murder of Giacomo Matteotti in 1924. After that he abandoned politics, in 1925 he resigned from the Chamber of Deputies, until in 1935 Mussolini's march into Ethiopia stirred Orlando's nationalism. He reappeared briefly in the political spotlight when he wrote Mussolini a supportive letter. In 1944, he made something of a political comeback. With the fall of Mussolini, Orlando became leader of the National Democratic Union. He was elected speaker of the Italian Chamber of Deputies, where he served until 1946. In 1946, he was elected to the Constituent Assembly of Italy and served as its president. In 1948 he was nominated senator for life, and was a candidate for the presidency of the republic (elected by Parliament) but was defeated by Luigi Einaudi. He died in 1952 in Rome. He was a controversial figure. Some authors criticize the blunt way he represented Italy at the 1919 Paris Peace Conference, in contrast to his more diplomatic foreign minister Sidney Sonnino. Other authors say that Orlando was connected to the Mafia and mafiosi from beginning to end of his long parliamentary career, but no court ever investigated the issue. The Mafia pentito – a state witness – Tommaso Buscetta claimed that Orlando actually was a member of the Mafia, a man of honour, himself. In Partinico he was supported by the Mafia boss Frank Coppola who had been deported back to Italy from the US. He maintained a strong rivalry with prominent statesman and party colleague Francesco Saverio Nitti,. French Prime Minister Georges Clemenceau and American President Woodrow Wilson criticized his behavior at the Paris Peace conference. ^ Marshall, S. L. A. The American Heritage History of World War I. New York. Page 215. ^ Wilcox, Vanda. "Italy in the Era of the Great War." Brill. April 2018. Page 204-205. ^ Signor Orlando Returns to Rome: The Financial Times (London, England),Friday, April 25, 1919; pg. 3; Edition 9525. Di Scala, Spencer. Vittorio Orlando: Italy. (Haus Publishing, 2010). Procacci, Giovanna. "Italy: From Interventionism to Fascism, 1917-1919." Journal of contemporary history 3.4 (1968): 153-176.